I have just posted sixty ways to have fun with your kids in corn around, corn, and with corn. Mini breaks make a world of difference and I know that pint-sized fun is better than no fun at all whether it’s a daytrip or a weekend escape, enjoying time together and making family memories matters. For adults it is a good excuse to behave like a kid again if only for a few hours. I love our family custom of selecting the perfect pumpkin (pumpkins because we always adopt extras). Here’s the scoop. The 2010 regional lists of reveal a plethora of chances to have fun with kids. It spans seven distinct geographic regions in the USA plus three regions within Canada. The collection of festivals and events spans the gamut from barnyard mini golf in Vermont and pumpkin bowling in Kansas to pig races, hayrides, living history, and most American of all corn mazes. Mini breaks in Canada include plenty of pumpkin patches, scarecrows, hay rides, corn piles, and apple picking plus corn quests in Nova Scotia and a cranberry bog encounter in British Columbia. For night owls there’s also maze adventures by moonlight or flashlight. 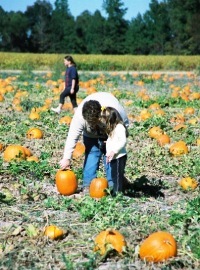 Our expanded list of family friendly Fall Festivals & Corn Mazes may be viewed at www.theFamilyTravelFiles.com by clicking on the special green and yellow folder labeled “aMAZEing Fun” or by selecting a region of the country and viewing the relevant feature. To expand the list for the future readers are encouraged to “Tell Mom” about their favorite family corn maze or fall festival.